There are some poems that one reads and simply forgets in the sea of poetry that surrounds us. Then there are other poems that one finds themselves returning to, time and again to experience a wave of emotions. 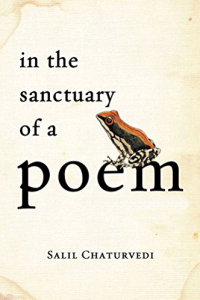 In The Sanctuary of A Poem by Salil Chaturvedi is a collection of poems that wrap themselves warmly around you and beckon for you to delve deeper into the pages that house them. It is poetry that brings out emotions that a callous world has forced us to bury ages ago. A beguilingly bewitching poet, Chaturvedi weaves simple words into intricate poems, which create a great escape. In his book, nature meets humor, everyday anecdotes prance into the arms of touching tales and the desire to immerse yourself into more engulfs the reader. The cover art is the first stop on this mesmerizing poetic journey into Chaturvedi’s mind. In the simplicity of the artwork and the peculiar nature of the frog, one expects luring eccentricity. His poetry speaks of how the world around us, as we know it, is odd and beautifully so. And despite all the strangeness, it is still perfectly ordinary. Chaturvedi opens our eyes to beauty in the seemingly mundane and points out the unusual in what is perceived as incredibly usual. From his poems, some fast favorites that simply clung to memory instantly are “Deliver a Packet To Me,” “Catnap,” and “Words Are Falling.” These poems struck a chord with me when I read them and stirred something in my heart, which left me longing for more. In “Catnap,” the words “it seems like there is someone else living inside me” is exactly how it feels when the words reach out from the book and pull us closer. Chaturvedi’s style of poetry is like a soft voice in our head that sing us to sleep. The distinct style that he possesses is one that sets him apart from a number of other poet’s works. The rich depictions and narrations combined with intrinsic details of life in India allow the reader to step into Chaturvedi’s world. We catch flights that don’t exist and book tickets that cost nothing, to be transported to the shades of babul trees and bright mustard fields. We can hear the roaring of the shallow streams and weedy deep gullies sounding from the spine of the book. The journey that Chaturvedi takes the reader on is one that is nothing short of being magical. The balm of Chaturvedi’s poems pull one into a world unlike any other, yet firmly remind us of the world we live in and the unbelievably bizarre nature of it all. Ghada Ibrahim is currently pursuing her undergraduate degree in Psychology. Aside from being an avid reader immersing herself in the literary world, she likes to live with no regrets. She has been blogging and writing since the age of 15 and aspires to become a published author one day to share her love for all things literary with the rest of the world.